In my experience, more scientists like dogs than cats (a dangerous assertion, I admit), which is why, perhaps, a cat ended up on the receiving end of the most famous thought experiment in history, Schrödinger’s Cat. 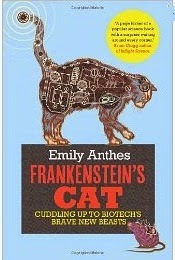 Although the cat in Emily Anthes’ title obviously owes its existence to its hypothetical quantum cousin, though, this isn’t a book about thought experiments, but the real things. From fluorescent fish to cyborg animals, this is the story of what we are really doing – or planning to do – to modify nature. For me, Anthes gets the balance just right in the book (though that ‘Frankenstein’ in the title is totally misleading in this respect). There are real moral issues to be considered in what we do to animals for our own benefit, but provided we take animal welfare into account, there is really no reason why we shouldn’t modify animals for our purposes. After all, we’ve been doing it for millennia through selective breeding – this is just a matter of doing it much more quickly and effectively. Anthes covers all sorts of possibilities, and is at her best when she’s dealing with the everyday life side of the experience. So, for instance, her opening story of the fluorescent Glo-fish (despite headlines beloved of tabloid editors, they don’t glow in the dark, they re-emit light at a different frequency) is totally fascinating in part because of the legal challenges faced by the entrepreneurs looking to bring the fish to market (something that still isn’t legal, for instance, in the EU). Making pets more interesting to look at may be fairly trivial (though as Anthes points out, it is surely more humane to make happy, healthy glowing fish than it is to distort goldfish into weird shapes so they have pop-eyes, as selective breeders have done for years), but we also meet much more useful possibilities in pharming – animals that have been modified so, for instance, their milk contains medically important proteins. Inevitably some animal rights types will moan, but surely it’s easier to justify keeping goats to produce medicine (in a normal and pleasant enough goaty life) than keeping rabbits as pets in cages (for instance). Then we get to the real heavy stuff – implants that turn animals into controllable devices. Here, rightly, the moral discussion comes very much to the fore. However, where the animals in questions are insects, as many of them are, most of us have relatively few qualms. I’d certainly rather an insect was wired up as a drone than was used for entertainment in I’m a Celebrity Get me Out of Here. Again, it’s the entrepreneurs that fascinate – specifically a pair that sell a ‘control your own cockroach’ kit to turn a cockroach into a remote controlled object and learn a bit about neuroscience along the way. Just occasionally I found the interest levels dropping a bit, and the way the book is pitched is just a little too casual for me with not quite enough science. But this is a very important area that is not going to go away and that we all ought to be thinking about. The way we have handled GM crops has been disastrous, resulting in the pathetic scene of supposedly humanitarian organizations preventing the use of crops that could help millions of people survive. We need to do better with modified animals – and this book is a good eye opener on the possibilities and the debates we will face. Recommended.